A daily dose of SJU values often increases your desire to help others. In fact, one of the most powerful pillars of the SJU holistic education is encouragement to take a closer look at who you share the world with, and our Service Learning programs give you plenty of scope. Because we feel so strongly about their educational value, some of them even lead to academic credit. Whether you’re in another neighbourhood or on another continent, your contribution will be about the gentle, gradual building of authentic, respectful partnerships based on acquiring a deep comprehension of the obstacles facing the person right in front of you. Your commitment will include ahead-of-time preparation along with follow-up reflection about how you’ll incorporate your new knowledge into your life. Warning: We call it “learning” for a reason. Your experience will undo any “quick-fix” expectations. Side effects include a revised global perspective, an altered view of your local community, permanent inner growth, and a possible shift in aspirations. Investigate all the possibilities, select a program that fits your own personality and goals, and take your compassion for a test run! Overseas: Discover the realities of the developing world first-hand. Pitch in with everything from construction work to preparing food and playing with children. Closer to home: Encounter the true-life version of local Kitchener-Waterloo social justice and development issues by witnessing the realities faced by the people affected. Discover how to support the dignity of all as you explore and work toward a more inclusive community. 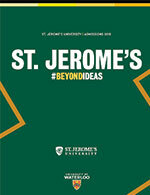 Without leaving St. Jerome’s: Take an in-depth look at your social justice assumptions and prepare to become a justice-based leader. SJ Roots – four all-day Saturday workshops throughout the school year that enable you to examine and develop your social justice roots as you determine your role in addressing injustice.